Sporadic outbreaks of bovine trypanosomiasis have been reported in Bolivia since 1996 when T. vivax and T. evansi were identified for the first time by parasitological means. However, comprehensive epidemiological information concerning T. vivax and T. evansi in the country is lacking. Current parasitological and serological diagnostic methods for trypanosomiasis have important limitations either in their sensitivity or specificity, which can result in unreliable data when applied in epidemiological studies. PCR assays are a recently developed procedure that might help to overcome the constraints of parasitological and serological assays. Therefore, the objective of this study was to evaluate PCR assays as a diagnostic tool for epidemiological studies in Bolivia. PCR assays for diagnosis of trypanosome infection in cattle were evaluated for their ability to detect trypanosome DNA in blood spots samples collected from cattle in four different provinces from the Bolivian lowlands and the results compared with those obtained with standard parasitological Micro Haematocrit Centrifugation Technique (MHCT) and stained smears and serological methods (Card Agglutination Test for T. evansi (CATT), and Antibody ELISAs for T. vivax and T. congolense). Kappa agreement analysis showed a significant agreement between PCR assays and results from parasitological methods but there was no agreement when PCR was compared with serological assays. Some samples from T. vivax smear positive animals were negative by PCR, therefore modifications to the PCR assay conditions were undertaken to try to improve agreement between PCR and parasitological assays. Changes in the template DNA concentration or the use of an alternative primer set resulted in improvements in the PCR detection rate, but not all the parasitologically positive samples were detected by PCR. Results from PCR assays for T. vivax and T. evansi were combined with results from parasitological and serological assays to provide information on prevalence rates for the four provinces from where the samples were obtained. The present study established evidence of the usefulness of PCR as diagnostic tool for epidemiological studies and confirmed that cattle trypanosomiasis appears to be endemic in several regions of the Bolivian lowlands. Cases of T. vivax trypanosomiasis in Bolivia have been reported since 1996 when commercial cattle transactions between the Brazilian and Bolivian borders were considered to be the source of introduction of trypanosomiasis into the Bolivian lowlands from the Brazilian Pantanal . During the first outbreaks of disease in cattle in Bolivia, both T. vivax and T. evansi were identified by parasitological observations. These outbreaks took place in the province of Chiquitos, Santa Cruz department, Bolivia. Later, further outbreaks of disease were confirmed in other provinces of Santa Cruz lowlands and the Department of Beni  (Laboratorio de Investigacion y Diagnostico Veterinario (LIDIVET)). Since the first case of disease in Chiquitos, the spread of the disease has been attributed to cattle movement within the Santa Cruz department, and the presence of high numbers of the vector (tabanids) [2, 3] has facilitated sporadic outbreaks on the few last years. At present, there is no information about the prevalence and distribution of T. vivax and T. evansi in the department. Currently the only data available are those relating to the outbreak, when the parasite identification was done by parasitological methods. A common pattern of the trypanosome infections is an intermittent parasitaemia which in T. vivax and particularly T. evansi infections in cattle is often very low. This feature complicates the diagnosis of infected animals, which in Bolivia was traditionally based on parasite identification in blood films. The effectiveness of parasitological methods as a diagnostic tool is limited by their low sensitivity, as they cannot identify animals with chronic infections and low parasitaemia . In order to try to overcome this problem, serological diagnostic techniques were developed but they did not succeed in completely resolving this problem. Serological diagnosis based on antibody detection lacks specificity and cannot differentiate current from past infection [5, 6]. Antigen detection assays are able to identify current infections but it has been proved that this kind of tests also lacks sensitivity [7, 8]. Recently, molecular diagnostic techniques particularly Polymerase Chain Reaction (PCR) assays appear to be a promising technique for the diagnosis of trypanosome infection based on the detection of trypanosome DNA. Primer sets for the specific diagnosis of T. vivax or T. evansi have been developed [9–14], however, limitations of sensitivity and specificity have been also reported for this DNA based diagnostic assays  and most of these PCR assays have not been tested under field conditions for the diagnosis of natural infection. There is a need for accurate information about the prevalence and distribution of bovine trypanosome infection in Bolivia in order to establish risk factors and develop control strategies. Several diagnostic assays are in use for epidemiological studies in the country, but most of them have limitation either in their sensitivity or their specificity. Currently, PCR assays appear to offer an opportunity to overcome some of these problems in the diagnosis of trypanosome infection. The objective of this study was to evaluate PCR assays applied to field samples from Bolivia as a diagnostic tool for epidemiological studies in this country. PCR products produced by one or both of the primer sets were found in blood spots collected from animals in three of the four provinces studied: Guarayos, Sara and Yacuma. No PCR product was amplified from any blood spots from Velazco. Samples positive by TWJ1/2 or TBR1/2 were found in each of the three areas. T. vivax PCR product was found in the following proportions: 5.98% in Guarayos, 0.42% in Sara and 4.84% in Yacuma. While the proportions of positives found for T. evansi PCR were: 2.39% in Guarayos, 2.50% in Sara and 1.61% in Yacuma. Mixed infections with both parasites were only found in Guarayos and in Sara. The proportion of positives for T. vivax in relation to T. evansi was higher in Guarayos and Yacuma, while in Sara the proportion of T. evansi was higher in relation to that of T. vivax positives. 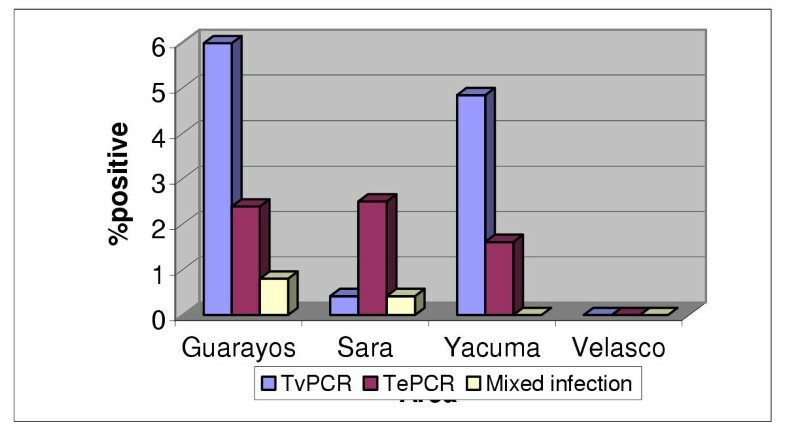 The highest proportion of T. vivax PCR positives was found in Guarayos and the lowest in Sara. The proportion of T. evansi positives was similar between Sara and Guarayos with the lowest proportion in Yacuma (fig 1). Trypanosome positive results by parasitological methods were obtained only in two of the four provinces studied; Guarayos and Sara. Table 2 shows the agreement between the results obtained with PCR assays with those obtained by parasitological assays. Differences were seen in the level of agreement between Guarayos and Sara. PCR assays showed a high degree of agreement with the parasitological methods in Guarayos, however, no agreement was found between these tests in Sara. In Guarayos, 13 samples were diagnosed positive for T. vivax by stained smear microscopy. Nine of these samples were positive by both smears and TvPCR. A significant agreement was found between the results obtained by thin smears and TvPCR (Kappa = 0.622). In Sara, none of the TvPCR positive results agreed with the positives by smears. Furthermore, TvPCR produced one positive result compared with 6 T. vivax positives diagnosed by smear observations. No significant agreement was found between smears and TvPCR in Sara (Kappa = -0.007) (tables 1 and 2). Nine samples in Guarayos and 4 in Sara were found positives for trypanosomes by Micro Haematocrit Centrifugation Technique (MHCT). In Guarayos an agreement between TvPCR and MHCT was seen with 5 positive samples, but in Sara none of the TvPCR posivite samples agreed with the positives by smears. Differences were seen in the level of agreement between Guarayos and Sara. While an agreement between MHCT with TvPCR was found in Guarayos (Kappa = 0.389), no statistical agreement was found in Sara (Kappa = -0.007) (tables 1 and 2). Statistically significant agreement was found between TvPCR with both smears and MHCT only in Guarayos. However, a higher degree of agreement was observed between TvPCR and smears (Kappa = 0.622) than TvPCR and MHCT (Kappa = 0.389). In Guarayos TvPCR detected an additional 6 positives, which were negative by parasitological methods. However, TvPCR failed to detect 6 parasitologically positive samples (4 of which were T. vivax positive by thin smear). Similar results were observed in Sara, with TvPCR unable to detect 6 parasitologically positive samples (table 3), but only 1 TvPCR positive was detected in this area, which was negative by parasitological methods. * There is no agreement analysis between TePCR and thin smears because T. evansi was not diagnosed in the smears observations. + Arbitrary bench marks for evaluating kappa values are : >0.81: almost perfect agreement; 0.61 – 0.80: substantial agreement; 0.41 – 0.60: moderate agreement; 0.21 – 0.40: fair agreement; 0 – 0.20: slight agreement; 0: poor agreement and negative results: no agreement. Kappa rages from 1 (complete agreement) to 0 (agreement is equal to that expected by chance) . PCR shows a statistical agreement with parasitological techniques only in Guarayos. There was no agreement between PCR and the parasitological methods in Sara. *All the thin smears positives were confirmed as T. vivax. No T. evansi positive was reported by Parasitology. + TWJ1/2 used with DNA template diluted 1/10. $ TePCR positive sample detected when the test was applied to all the blood spots and later when modifications in the DNA template concentrations were applied. T. evansi was not detected in smears from any of the regions sampled. However, TePCR did detect positives in Guarayos, Sara and Yacuma (fig 1). No agreement analysis could be done, therefore, in relation to TePCR and smears observations. MHCT detected trypanosomes only in Guarayos and Sara. A significant agreement between these tests was found only in Guarayos (kappa = 0.245) (Table 2), where 2 MHCT positive results were also positives by TePCR. In Sara, however, there was no agreement between MHCT and TePCR. In Guarayos 7 of the MHCT positives were TePCR negatives while in Sara all 4 MHCT positives were negatives by TePCR (table 3). Changing the volume of the DNA template preparation (blood spot eluate) from 7.5 μl to 10 μl did not improve the detection rate of the parasitologically positive samples tested. However, improvements were obtained when the blood spot eluate was diluted 1/10 in distilled water and then used in a volume of 10 μl in the total 25 μl PCR reaction mixture. TvPCR produced PCR products in 2 out of 6 samples from Guarayos, which had been classed as PCR negative under the original assay conditions. However, 4 samples from Guarayos, and all the 6 samples from Sara remained PCR negative under the new assay conditions. Similar modifications to the TePCR assay did not result in improved agreement with the MHCT. With all the TePCR negative samples remaining negative. No differences were seen in the quality of band resolution when using eluate at a volume of 7.5 μl or 10 μl. in both cases; the TWJ1/2 primer set confirmed 5 out of the 38 samples. Seven samples and additional 2 samples, however, were classified as PCR positive when the DNA template preparation (blood spot eluate) was diluted 1/10. The assay modifications did not result in improvement in band resolution or PCR detection rate when carried out with TePCR assay. Improved results in relation to the PCR detection rate were observed when retesting both parasitologically positive samples but PCR negatives (table 3) and TvPCR doubtful samples, with the TVWA/B primer set. Using TVWA/B primer set, 4 out of 6 samples from Guarayos and 1 out of 6 samples from Sara were amplified at all the eluate volume and dilutions tested. TVWA/B primer set detected 3 more positive samples than the number of samples detected by TWJ1/2 primer set when the eluate was diluted 1/10. 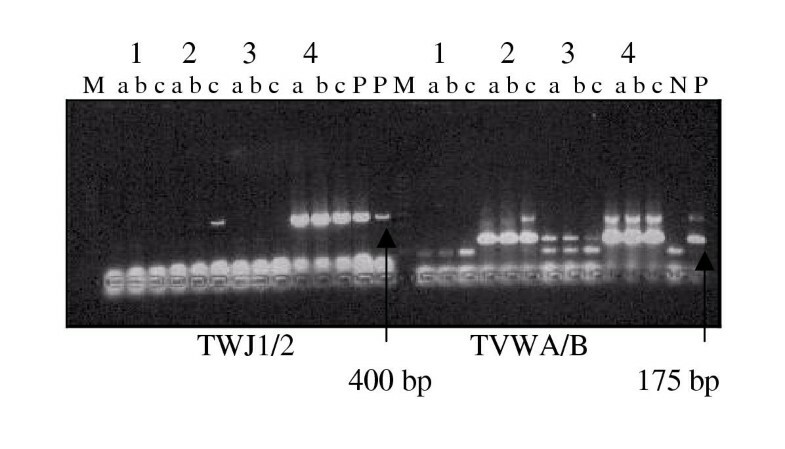 Furthermore, TVWA/B primer set was the only one that amplified DNA from samples from Sara (fig 2). Parasitologically positive samples tested with modification in the DNA concentration and with a new set of primers (M) Molecular marker (a) Template DNA used at a volume of 10 μl (b) Template DNA used at a volume of 7.5 μl (c) Template DNA diluted 1/10 (1) Known negative sample used as control (2) Parasitologically positive sample from Guarayos (3) Parasitologically positive sample from Sara (4) Known Parasitologically positive sample from Guarayos, which was used for the first time when optimising the PCR assay. And now was used as one of the controls. PCR products were obtained with samples at all three template DNA concentrations. TVWA/B primer set detected 8 positive samples. One more than the number of positive samples detected by TWJ1/2 with elution preparation diluted 1/10. And 3 further more positives samples than the number of samples detected by TWJ1/2 without modifications to the DNA template preparation. Table 4 and fig 3 summarise the results obtained under different assay conditions with TWJ1/2 and TVWA/B primer sets. Improved PCR detection rate was obtained with the TVWA/B primer set when compared with the TWJ1/2 primers. Changes in the DNA template concentration by dilution of the blood spot eluate preparation improved the detection rate of the TWJ1/2 primer set. However, TVWA/B detected the highest number of TvPCR positives irrespective of changes in assay conditions. Results obtained with modified DNA template concentrations and a different primer set False negatives: parasitologically positive samples but PCR negatives. High proportion of positive results was obtained with each of the serological tests. However, in most cases there was no significant agreement between the results from these tests and those from PCR assays (tables 5 and 6). * Remaining sample results from accepted Elisa plates ** Blank results are because the tests were not carried out. Results from this test were obtained from two provinces only, Guarayos and Sara (table 5). The number of positives by the CATT test was greater than the number of positives obtained by TePCR and TvPCR in both provinces, particularly in Guarayos. However, a Kappa agreement analysis between CATT and either TePCR or TvPCR showed a slight agreement in both provinces Guarayos and Sara. The proportion of CATT positives in Guarayos was greater than in Sara. This differed from the TePCR results, which showed a relative higher proportion of positives in Sara than in Guarayos (tables 5 and 6). TvELISA positive samples were found in the four provinces tested., in a greater proportion than the number of TvPCR or TePCR positives. There was no significant agreement between TvELISA and TvPCR or TePCR in Guarayos and Sara, but a slight agreement was seen in Yacuma between TvELISA and both PCR assays. Guarayos had the highest proportion of TvELISA positives, this was followed by Yacuma, Sara and Velazco having the lowest proportion of seropositives. TvPCR assay showed a similar pattern with the highest proportion of diagnosed positives in Guarayos and the lowest in Sara (tables 5 and 6). As the other serological tests, high proportions of positives were found in each of the four provinces studied. When this test was compared with TvPCR, no agreement was found in Guarayos and Sara. However, a slight agreement was obtained in Yacuma. When compared with TePCR no agreement was found in Sara and Guarayos with slight agreement in Yacuma. In contrast with the other serological tests, the second highest proportion of TcELISA positives was found in Velazco, where neither PCR nor parasitologically positive samples were obtained. The lowest proportion of TcELISA positives was found in Sara (table 5 and 6). The use of PCR assays for the detection of trypanosome DNA in cattle blood dried as blood spots was confirmed in this study. In that it was possible to detect evidence of T. vivax or T. evansi infections by carrying out PCR on eluates from blood spots. PCR products for trypanosome DNA were obtained with samples from cattle in three of the four provinces studied: Guarayos, Sara and Yacuma, while parasitologically evidence of infection was obtained only from Guarayos and Sara. Therefore, PCR assays were able to detect evidence of infection in areas were parasitological techniques failed to do so. Furthermore, PCR assays were able to detect evidence of T. evansi infection, while examination of stained smear observation only identified the presence of T. vivax. The fact that PCR assays provided evidence of infection in animals that were classified as uninfected by parasitological techniques suggests that PCR techniques could have an important role to play in the detection of infected animals harbouring a low parasitaemia that would be undetectable by smears or MHCT. The improved detection rates found in the present study, was also reported in studies carried out in the Brazilian pantanal [14, 16]. The better PCR sensitivity and the fact that samples can be taken as blood spots on filter papers open the opportunity to carry out epidemiological studies in remote regions in countries like Bolivia where accessibility and conditions to store samples are really difficult. The use of nuclear – based Trypanozoon specific primer sets (TBR1/2) was suitable for the detection of T. evansi DNA. The primer set does not distinguish between members of the subgenus Trypanozoon but as T. evansi is the only member of this subgenus that infects cattle reported in South America, the presence of PCR product has been taken as indicative of T. evansi infection. Furthermore, the target sequence for this primers are not found in the kinetoplast making results independent of the parasite kinetoplastic state, which is currently unknown in Bolivia and avoids the problem of failure of primers targeting kDNA as has been reported in South America . The use of the TBR1/2 primer set not only permitted the differentiation between T. vivax or T. evansi DNA but also the detection of cattle samples harbouring mixed infections, which in this study was not revealed with smears observations as none of the parasitologically positive samples in this study were reported positive for T. evansi. This lack of parasitological evidence for T. evansi infection is a characteristic of this parasite, which usually causes a chronic disease with low parasitaemia in cattle. Previously in Bolivia T. evansi has only been reported in a mixed infection with T. vivax in one diseased animal during a severe outbreak in the Bolivian lowlands . Any new diagnostic method needs to be evaluated against existing methods. Ideally this should be against a technique that is able to detect 100% of infected animals – a "gold standard". However, in the case of trypanosome infection no standard exists. Parasitological evidence continues to be the only absolute indicator of infection, although parasitologically negative animals can be harbouring infection at levels undetectable parasitologically. Validation of the PCR assays in the present study has therefore been carried out against samples from parasitologically positive animals. Kappa agreement analysis between PCR assays and parasitological assays showed differences in agreement in Guarayos and Sara. In Guarayos the agreement between TvPCR with smears and MHCT and TePCR with MHCT was significant while in Sara there was no agreement between the results from these tests. Tests disagreement was associated with the fact that most of the parasitologically positive samples, identified as T. vivax, were not detected by the TvPCR assay. All the T. vivax positive smear samples from Sara were negative by TvPCR, while only 46% (6/13) of such samples were TvPCR negatives in the samples from Guarayos. Trying to improve agreement between parasitological and PCR assays, the effects of modifications to the PCR assay were examined. Diluting the blood spot eluate with distilled water resulted in an improved detection rate by PCR assay; in an addition 2 T. vivax smear positive samples from Guarayos were now classified as positives by TvPCR. The failure to detect under the conditions of the original PCR assay was probably related to the template DNA concentration in the eluate was so high, that resulted in inhibition of the PCR amplification process. A similar observation was reported by , who after diluting of sera samples, obtained an improvement in PCR detection rates. However, this improvement was attributed to the dilution of inhibitory components for the PCR reaction present in sera, such us antigens and antibodies, rather than the parasite DNA dilution. In the present study the presence of haemoglobin in the blood spot eluate might have been inhibitory to the PCR reaction, which was reduced by dilution of the eluate. As part of the attempts to improve agreement between PCR and parasitological assays, an alternative T. vivax primer set was used (TVWA/B). These primers successfully amplified DNA from four of the samples that were classed as PCR negative under the original assay conditions from Guarayos and one from Sara. The latter, it was the only sample from all the smears T. vivax positive samples from Sara that was amplified by PCR. The changes made to the template DNA concentrations by dilution of the eluate also improved PCR detection rate of parasitologically negative samples that had produced ambivalent results with the TWJ1/2 primers. As in the case of the parasitologically positive and PCR negative samples, the second set of primers (TVWA/B) resulted in an improved detection rate when compared with the TWJ1/2 primer set regardless the eluate dilution. However, statistical analysis of the significance of these results could not be carried out due to the small sample size. The results obtained during the present study with the different primer sets differ from those reported by [12, 17]. They reported the presence of the cDNA sequence targeted by the TWJ1/2 primer set, in several T. vivax stocks from Africa and South America. The results from the present study suggest that some stocks of T. vivax from Bolivia do not have this sequence in their DNA, in that these were a number of smear positive but PCR negative samples, however, the use of TVWA/B primers resulted in a PCR product. The present results also differ from results obtained by , who used T. vivax primer set, TVMR/F, which target a similar cDNA sequence to the TWJ1/2 primers. Morlais  obtained an improved detection rate with the TVMR/F primers in relation to TVWA/B. They found that a higher number of T. vivax positive samples from Cameroon were misclassified by TVW than TVM and concluded that the DNA sequence targeted by the TVW primer set is not conserved in all T. vivax isolates from this region. However, results from the present study suggest that the DNA sequence targeted by the TVWA/B primers is present within all the T. vivax population examined in Bolivia. However, the potential confounding problem of genetic diversity on the efficiency of PCR assays needs to be addressed. However, despite the attempts to modify the PCR assay to improve the detection rate, seven parasitologically positive samples failed to produce PCR product with none of the primers at any of the template dilutions. This finding might be due to the presence of different strains of the parasite in this area or technical or procedural failure in processing the samples. Two samples from Guarayos and one from Sara were only detected with the second primer set (TVWA/B) suggesting differences in the genome that could merit further studies. Differences between trypanosome DNA sequences related to geographical location have been reported for T. vivax by PCR assays [18, 10, 19, 15], but these only have been carried out with stocks from Africa where tsetse transmission might promote genetic diversity. Other reasons for the PCR amplification failure could be the following: (1) the trypanosome DNA was degraded [15, 19] during or after extraction from the blood spots or during storage and transportation. (2) Low DNA concentrations, therefore insufficient DNA to produce a visible PCR product . This would be unlikely as there was no amplification when the template DNA concentration was increased as a consequence of increasing the eluate volume added to the reaction mixture. Furthermore, all these blood spots were from parasitologically positive samples; therefore, a high DNA concentration could be expected from the relatively high parasitaemia required for detection by smears. (3) Failure in the DNA extraction process to produce a DNA of sufficient quality or quantity  or presence of inhibitory components in the sample for the PCR reaction . This would seem to be unlikely, as similarly processed blood spot controls were included in every set of samples that was processed. Serological tests based on antibody or antigen detection are widely used as diagnostic procedures and antibody based assays were included in the current study of trypanosome distribution. Although the results from these assays cannot be taken as absolute evidence of infection, the results were compared with those from PCR assays as part of the validation study. Antibodies to trypanosomes were found in samples from all the provinces tested, and in each case the proportion of seropositives was higher than that detected by PCR. No agreement was found between results obtained by PCR assays and antibody ELISA tests, which might be the result of antibody persistence or cross – reaction between both trypanosomes leading to high proportion of positive results, which are not necessary indicative of active infection. The high proportion of positive results found with T. congolense ELISA is a strong evidence of cross-reaction phenomenon commonly found in serological tests as T. congolense has not been reported from outside Africa. Similar limitations in interpreting results from antibody ELISAs for T. congolense or T. vivax or T. brucei have been reported [6, 20]. Prevalence rate results by CATT depend on detecting antibody to a commonly occurring predominant VAT for T. evansi. The prevalence rates obtained by CATT were significantly lower in relation to the ELISA tests, which would suggest a higher specificity of CATT in relation to ELISA. However, a slight kappa agreement was found between CATT results and those of TePCR or TvPCR suggesting problems of non – specificity with the test caused by common VATs between T. evansi and T. vivax. The results from the parasitological, serological and PCR assays were used to obtain information in the distribution of trypanosome infection in the areas of the Bolivian Lowlands. Evidence of T. vivax and T. evansi infection in cattle was found in Guarayos Sara and Yacuma by parasitology and by detection of DNA by PCR of these parasites. Additionally, high seroprevalence rates were obtained in all four provinces. Overall evidence from this study confirms that trypanosome infection in cattle is endemic in the provinces of Guarayos and Sara and likely to be so in other provinces. The presence of trypanosome infection in Guarayos has been established since 1996 when parasitological methods were used during severe outbreaks . Later in Sara, animals with high parasitaemia were detected by smears or MHCT. However, since the initial reporting of disease in cattle in these areas, sporadic outbreaks have been reported (LIDIVET), but it was not until the present study that more detailed information on these parasites has been available through the use of a range of diagnostic methods. Analysis of prevalence rates showed that there were no significative differences in the parasitological and PCR prevalence rates in samples from Guarayos and Sara provinces, except for TvPCR prevalence rates, which was significantly higher in Guarayos than in Sara, this latter finding is possibly linked to the fact that most of the TvPCR false negatives were from Sara. However, the difference in the seroprevalence rates was significantly higher in Guarayos than in Sara. These differences might be related to a higher risk of cattle exposure to trypanosome infection in Guarayos related to a higher proportion of animals with higher parasitaemia than in Sara, but more likely related to vector abundance. Results from vector abundance studies in these two provinces identified a greater abundance of tabanids in Guarayos than Sara  and hence a potentially greater risk of transmission in Guarayos. The results from assays used in the present study provided for the first time evidence that T. vivax or T. evansi infection is present in Yacuma, Beni. Cases of suspected clinical trypanosomiasis have been reported over a number of years to local veterinarians but these cases could not be confirmed by available diagnostic methods. However, the detection of T. vivax and T. evansi DNA in samples from Yacuma is a strong evidence of the presence of these infections in this province. Neither parasitological methods nor PCR assays produced evidence of trypanosome infection in Velazco, however high seroprevalence rates were obtained. Despite the fact that seropositive results do not necessarily imply active infection in the region, there has been a background of severe trypanosomiasis outbreaks in this province, which was confirmed by parasitological identification of trypanosomes durin 1996  and 1998 . Furthermore, this province is located in the area classified of high tabanids challenge by . And therefore, it is likely that this province is endemic for trypanosomiasis. However, the factors contributing to the infection patterns – absence of parasite, PCR positives but high seroprevalence – need further study and the implications for control understood. Although evidence was obtained of an improved detection rate with TVW primers when compared with TWJ primers, problems of availability of reagents in Bolivia did not permit the retesting of all the samples and it is possible that further DNA positives might have been detected if the TVW primers had been applied to all the samples. PCR assays with the different primer sets produced evidence that strain difference might occur between T. vivax stocks in Bolivia. However, more work needs to be done to characterize any differences and their significance, especially in relation to the use of particular primers for the diagnosis of T. vivax in the country. Genetic differences between stocks in different areas might require the development of local or regional (South America) primer sets which might help to overcome some of the problems associated with PCR miss – identification of infected animals. The availability of such local primer sets would be an essential tool for the successful diagnosis and accurate epidemiological studies. However, the PCR assays as applied in the present study provided specific identification of T. vivax or T. evansi or mixed infections, and importantly, PCR was able to detect samples that were negative by parasitological means. The present study, therefore, has provided further evidence of the usefulness of PCR assays as a diagnostic tool for trypanosome epidemiological surveillance in countries such as Bolivia. However, there is a need for careful considering of assay conditions and primer sets for future use in such studies. However at the moments it is likely that a PCR can only be considered to be an additional tool for diagnosis and there will be a continuing need to use parasitological and serological assays in epidemiological studies. The results of the present study provided evidence of the potential of PCR assays as a diagnostic tool for epidemiological surveillance in countries such us Bolivia. The PCR assays curried out in the present study provided specific identification of T. vivax or T. evansi DNA as single or mixed infections, and were able to obtain evidence of infection in animals, which were negative by parasitological means. However, despite the attempts to modify the PCR assay to improve the assay detection rate, a number of T. vivax parasitologically positive but PCR negative samples remained. Some evidence was obtained that this might be due to strain difference as some samples produced PCR products with one primer set (TVW) and not with another set (TWJ). Further studies need to be carried out about the significance of T. vivax strain differences in Bolivia and their impact on the performance of PCR assays for the diagnosis of this parasite. Such understanding might help to minimize problems of PCR false negatives and contribute towards efficient use of PCR assays in epidemiological studies in the Bolivian lowlands, where trypanosomiasis is likely to be endemic as was suggested from results found with all the diagnostic techniques applied in the present study. Therefore, the study found that PCR assays had considerable potential for use in epidemiological studies on trypanosomiasis in countries such as Bolivia, however, a careful consideration is required in selection of assay conditions and primer sets in particular and their use should be combined with parasitological techniques. The sample collection was carried out between June and September 2001 from the provinces of Guarayos (n = 252), Sara (n = 248), Velazco (n = 150) and Yacuma (n = 250). The sample areas are located in Santa Cruz department (first 3 provinces) and Beni department. Both departments are located in the Bolivian Lowlands. Each locality was divided into four geographical strata to provide even geographical covering of the sampling area. The farms were randomly selected with each stratum, based on a frame supplied by the local farmers society. Finally, the sampled animals were randomly selected within each farm. The number of samples by farm was decided proportional to the total number of animals in the farm, or according to availability. The Micro Haematocrit Centrifugation Technique (MHCT) for parasitological diagnosis was carried out in situ, as part of the sampling. Blood for preparing thin blood films and for the MHCT diagnosis was collected from cattle's ear veins. Additional blood samples were collected from cattle's tail vein into vacutainer tubes with EDTA for blood spots preparation and without EDTA for serological test. The thin blood films and the serum samples were prepared for laboratory diagnosis at LIDIVET (Santa Cruz – Bolivia). Blood spots on filter papers and then immersed in acetone were prepared for PCR assays at Centre for Tropical Veterinary Medicine (CTVM), university of Edinburgh. Cart agglutination test for trypanosomiasis/Trypanosoma evansi (CATT/T. evansi) supplied by the Institute of Tropical Medicine, Laboratory of Serology, Antwerp, Belgium. The test was carried out according to supplier's instructions. Results discrimination was based on the degree of agglutination observed. No agglutination reaction was considered as negative, while reactions of +, ++, or +++ were considered as positive. Two antibody ELISA Kits using pre – coated plates either with T. congolense or T. vivax denaturated antigens, which were supplied by the Join FAO/IAEA programme. Both test were curried out according to the kit's bench protocol and serum results were expressed as the percentage positive value (PP) of the strong positive serum control supplied with the kit. Only results of samples from ELISA plates that met at least the first level of Internal Quality Control (IQC) evaluations were used and their positive/negative discrimination was based on PP cut off points recommended by IAEA and already evaluated with Bolivian samples by . With some samples missing, almost all blood spots samples from Guarayos (n = 251) and Sara (n = 241) provinces were tested by PCR. For economical reasons only 127 samples from Yacuma and 48 from Velasco randomly selected were also tested by this method. The DNA extraction was carried out as described by . A 6 mm diameter disc was punched from the blood spot preparations and placed into a 500 μl microcetrifuge tube. 200 μl of sterile distilled water was added and the tube incubated at 37°C in a thermocycler for 30 min, then centrifuged at 10 000 rpm for 10 min and the resulting supernatant ('cold eluate') was removed. The disk was resuspended in 100 μl of sterile distilled water and incubated at 99°C for 30 min. After centrifugation the supernatant ('hot eluate') was removed and transferred to a clean tube. The resulting 'hot eluate' was stored at 4°C and processed within 24 h of isolation. All the samples were processed using TWJ1/2 and TBR1/2 primer sets. The PCR amplifications were conducted in 25 μl reaction mixtures containing as final concentrations: 10 mM Tris – HCL, pH 8.3, 50 mM KCl, 1.5 mM MgCl2, 200 μM each of the four deoxynucleoside triphosphates (dNTPs) and 1 unit of Taq DNA polymerase (REDTaq SuperPak DNA Polymerase, Sigma). These concentrations were the same for both primer sets. Primers were supplied to a final concentration of 2 μM (TWJ1/2) and 0.4 μM (TBR1/2). DNA – eluate preparations as well as negative control (A clean filter paper disk included in every DNA extraction) accounted for 7.5 μl of the total PCR reaction volume. DNA positive controls were extracted from whole blood of infected animals, and 1 μl of the resulted eluate was used in the final reaction mixture. Amplifications were carried out using Peltier Thermal Cycler (DNA engine DYAD). For TWJ1/2, cycles consisted of an initial denaturing step at 94°C for 3 min followed by 30 cycles of denaturing step at 94°C for 1 min, and annealing step at 55°C for 2 min, and an extension step at 72°C for 2 min. Each amplification was completed with a 72°C incubation for 5 min to ensure the completion of the extension reactions. For TBR1/2, cycles consisted of an initial denaturing step at 94°C for 3 min followed by 30 cycles of denaturing step at 94°C for 45 sec, and annealing step at 60°C for 1 min, and an extension step at 72°C for 30 sec. A terminal extension at 72°C for 5 min. Twelve parasitologically positive samples were reassessed under the modifications applied in this process (table 3). A total of 38 samples negative by parasitology, but with PCR produced bands that were too weak to be classified as PCR positive or the molecular size of the band was not clear, were also reassessed under the modifications applied in this process. The PCR procedure was modified by changes in the volume and/or dilution of the blood spot eluate in the final reaction volume 25 μl. Each sample was tested using the following blood spot eluate – volumes of: a) 10 μl, b) 7.5 μl and c) 10 μl of diluted eluate in distilled water 1/10. The reaction conditions remained the same for TWJ1/2 and TBR1/2 as in section 6.3.3.1. The amplification reaction was conducted at the same reagent concentrations as for TWJ and TBR. The primers were supplied to a final concentration of 1μM. Cycles consisted of an initial denaturing step at 94°C for 3 min followed by 30 cycles of denaturing step at 94°C for 30 sec, and annealing step at 60°C for 1 min, and an extension step at 72°C for 30 sec. A terminal extension at 72°C for 5 min. The total 25 μl of amplification mixture were loaded onto a 1.5% agarose gel. Electrophoresis was processed for 40 min at 100 V. The gel was stained with Ethidium bromide and the samples were examined under UV light. Data analyses were carried out based on the PCR assay results and the results obtained of the parasitological and serological diagnosis. The agreement of test results was based on the analysis of the Kappa statistics using a computer programme Win Episcope 2.0 Prevalence rates and comparison of proportions were carried out based on X2 or Fisher exact test using the programme Epi Info version 6. We wish to thank the Joint FAO/IAEA Division of Nuclear Techniques in Food and Agriculture for technical support and financial assistance. We are also grateful to the DFID and the link LIDIVET – CTVM for the additional financial support. J.L. designed the study, participated during the sampling process, carried out the PCR assays, the statistical analysis and drafted the manuscript. T.W. participated in the design, coordination and writing of the manuscript. K.P. participated in the PCR analysis. H.R. carried out the serological assays and participated in the sampling process.